While many of the Hooters Pro Cup competitors had a long haul across the Mason/Dixon line to Lonesome Pine Speedway, DJ Kennington had to come across two lines. Kennington, a regular on the Pro Cup Northern division, made the 14-hour trek over the border from Ontario, Canada to Virginia. The long tow paid off. Kennington, who had a strong showing in the season opener, came back from a lap down to score a ninth place finish. “We were short guys,” says Kennington. “We had a bunch of guys together who had never been together before. Because of that we went a lap down in the pits. We had trouble changing the front tires and went a lap down. It put us in a hole and we had to use up quite a bit to get back on the lead lap. When we did get back on the lead lap we had nothing left. He addressed concerns about safety on pit road to Fritz Augustine and the rest of the Hooters Pro Cup officials. And the officials listened and responded that night to the concern. “We talked to the officials about it because it is a safety issue that needed to be addressed and they made a change tonight to try something. Gary St. Amant had about one of the most interesting and stressful days a racer could ever have. But the team nearly couldn't find O'Quinn's shop. Then, the rains subsided and a practice session was scheduled. The team hurried up and loaded the car back in the trailer and rushed back to the track. But the troubles weren't over just yet. When practice started, St. Amant was standing outside the gate with his helmet and suit on waiting for a chance to get into the infield. When Gary finally got into the track, they were only able to get ten to fifteen laps of practice in. 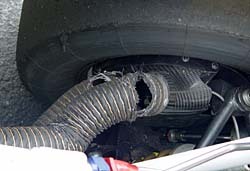 At the end of that practice a cooling duct for the brakes, which was rubbing on the right front tire, caught fire. St. Amant pulled in, lifted the hood, and remedied the smoking problem. Then just before qualifying, they realized the water pump was broke. So the team had to rush and replace it. Gary almost missed qualifying and was the last car to take time. They had to take a provisional to make the field. Now it's race time and everything is set... not so. The radios are not working. But through all of the panic, Gary kept a positive attitude and his trademark smile. When the car fired for the race the radios somehow worked. The problems kept coming for St. Amant. 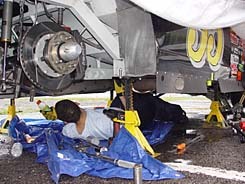 (Above) The hole in the brake ducts and a broken water pump weren't the only things that went wrong. Gary went on to wheel the JEGS #11 from the 25th place starting spot to a very respectable and hard earned seventh place finish. “This probably was the biggest cluster-day I've ever had since I've gone racing,” laughed Gary from his hauler after the race. “I told everyone on the team that I see some good things happening with the team. Yes, we were behind on everything when we got here and had problems like the radios not working until we started the engines. A lot of things were having problems. But through it all, I started to see the team come together. AJ Frank shared the Hard Charger award with Gary St. Amant at the end of the Food City 250, both improving 18-spots from their starting positions. Frank messed up in qualifying and shook off the poor effort to charge to a podium finish. But his charge to the front was almost erased when contact between with Danny O'Quinn sent Frank's #45 spinning. But an amazing recovery and a little help from the tower gave Frank his spot back. “I really wanted to protect that bottom and I don't think Danny meant to but he caught us a little quicker than he expected and turned us around. I don't like the fact that he drove into the back of me. I would have liked to race him. Frank then capitalized on a great pit stop to get a third place finish that he was very proud of. “I think we drove to fifth before the pit stop. Then we pitted and came out third. It's a great night. Rookie of the Race and the Hard Charger award. I was having fun. The Late Model Stock standout, who was recently signed with Joe Gibbs Racing, now has a seventh and a fifth in first two Pro Cup races. 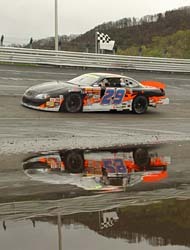 It was a very wet day at Lonesome Pine Speedway. Much of the day was spent waiting for the constant drizzle to stop. At times in the morning, the sky would tease you appearing to clear. Then it would dump down heavier rain. Hard work paid off for several teams in the Pro Cup stop at Lonesome Pine. But one team in particular was ecstatic with their work ethic and result at the end of the night. A smile from ear to ear gave it away that the happy driver was rookie Woody Howard. Howard's team worked hard in the rain, without a tent to cover them, to get the car up to speed. The puddle soaked crew and their driver were pretty happy with the result. “This is awesome to come here and finish fifth,” said Woody. “We worked day and night just to get here. Most of the 40 drivers in Virginia were doubtful that they would get anything run. But somehow it all worked out. 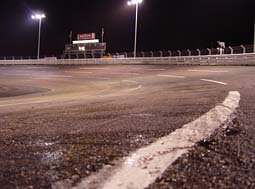 When the skies cleared Pro Cup officials got trucks on the track in an attempt to dry the racing surface. A short time later, cars were sent out on the track for practice. Many in the paddock scratched their heads in disbelief at the call. 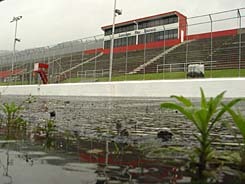 The track was visibly damp. But the cars hit the track and a dry groove was worked in. According to AJ Frank, the wet conditions played a major role in his qualifying effort. The damp conditions and light drizzle continued sporadically throughout the day and night. And even though it didn't make for the best racing conditions, the race ran relatively clean to the finish. 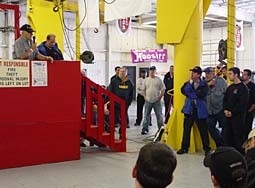 It started out as a fairly normal drivers meeting in the garage outside of the backstretch at Lonesome Pine Speedway. But at the end of the Pro Cup Northern Division meeting, Southern ace Clay Rogers spoke up. This year's race winner, Joel Kauffman knew he had to tread lightly on the wet racetrack. 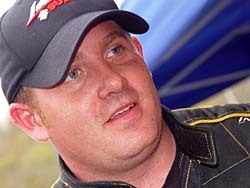 Both Danny O'Quinn and Johnny Rumley were on their way to fourth and fifth place finishes when they took the white flag. But coming around turn-four, Rumley tapped O'Quinn and sent the local boy spinning. The crowd was very unhappy with the contact. Rumley hopped to fourth and O'Quinn's spin forced him to finish 10th. “I just got turned around that is about it, said a clearly frustrated O'Quinn. “It's the last lap and none of them really care what happens on the last lap. They are going to get into you. Rumley admitted to the contact but wasn't awfully sorry about it. 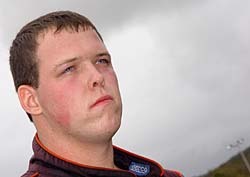 Danny O'Quinn was recently signed to a driver development deal with Roush Racing. As the case for many sports, it's hard to win if you are taking penalties. A penalty can ruin a potential winning drive in football, or give the other team a power play in Hockey. In racing, it is no different. And rookie Pro Cupper Travis Miller found that out the hard way at Lonesome Pine. Penalties and bad luck resulted in a dismal 16th place finish for Miller. “The first thing that happened to me is when someone spun there on the backstretch,” said Miller. “The guy didn't put on the brakes and backed up into me. That was too bad. 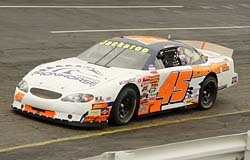 Benny Gordon was the only driver who physically had a shot to beat Joel Kauffman. The two did get physical once or twice, but Gordon knew his car was no match for Kauffman's #44. So like any smart racer, Gordon didn't overdrive his car, which was a brand new chassis, and took the runner-up finish. “Our car wasn't all that bad,” said Gordon next to victory lane. “His was just real good. We know where we are off. We just haven't done a lot of testing so we are trying to get caught up. This is a brand new car and we are going to figure out what this setup needs with these tires. Because of the rain Pro Cup officials were forced to shorten practice to only a one hour session. Then qualifying was cut to just one lap. So drivers had only one lap to make the show or go home. And for a few, who had very little experience at Lonesome Pine or in a Pro Cup car, that was a very difficult task. 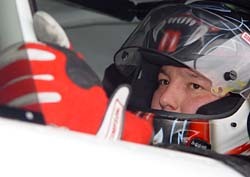 And for NASCAR Modified regular Donny Lia, who had no experience in a full-fendered car, Pro Cup machine or any previous laps at Lonesome Pine, it was white knuckle time. Lia surprised many, turning in the third quickest lap of qualifying. - Jeff Agnew had to unload a backup car after his #73 broke in qualifying. The bad luck continued as he pulled it in the infield early in the race with mechanical problems. - Eric Sartin, came home an impressive 12th in his pro cup debut. - Glen Gault had a top-ten run going until he came into the pits too early. When the #32 pulled down a closed pit road, officials were forced to give the team a penalty sending them to the rear of the longest line. Gault managed a 14th place finish. 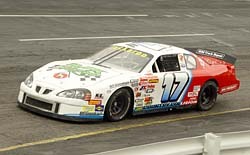 - Mardy Lindley led 40 laps of the Food City 250 but couldn't hang on at the end and faded to a 6th place finish. - Rookie Leslie Law, making his first start at Lonesome Pine, hit the wall in practice but qualified for the show. He struggled and dropped out to finish 25th. 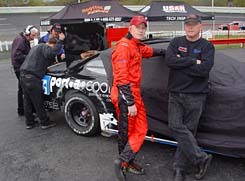 - Danny O'Quinn, a former track regular who knows Lonesome Pine like the back of his hand, turned in the quickest lap in qualifying and won the Advance Auto Parts Pole Award $1000 bonus.